Steamed mussels with white wine is a classic dish and it's incredibly easy to make. The recipe below will serve four people for dinner. 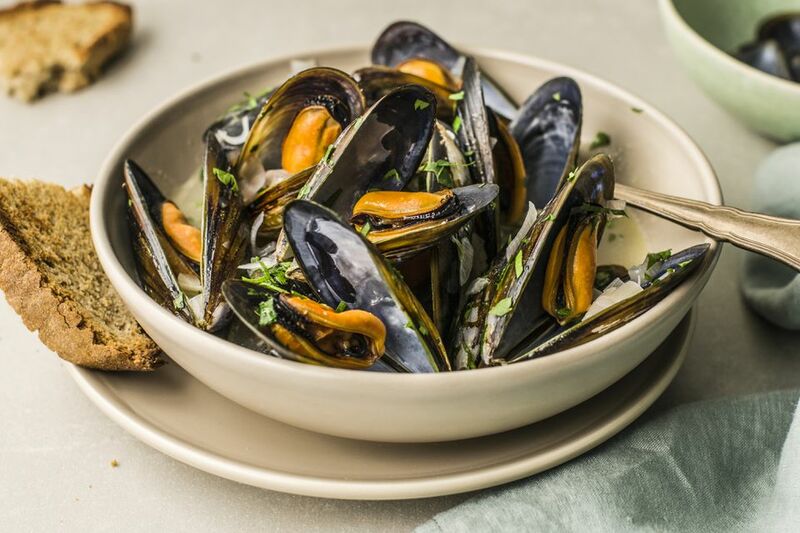 The mussels' natural juices combine with the white wine and butter to make its own sauce, and it really is a heavenly, golden elixir of which you'll want to savor every last drop. To that end, I like to serve the mussels in wide bowls with crusty bread (like this classic French baguette) for soaking up the sauce, but you can serve them with pasta or even rice. The recipe doesn't call for salt because the mussels are naturally briny. Also, while it's traditional to use shallots with mussels, it's fine if all you can get are onions. Sort, scrub, and de-beard the mussels. Rinse with cold water. Combine the wine, garlic, shallots, and black pepper in a wide stock pot or soup pot and bring to a boil over high heat. Add the mussels and cover the pan with a tightly fitting lid. Lower heat to medium-high and cook for 5 to 6 minutes or until most of the mussels have opened. Don't overcook, or the mussels can become rubbery. Stir in the butter and parsley and stir until the butter melts into the liquid. Serve in large bowls with the cooking liquid, along with plenty of crusty bread for soaking up the fragrant sauce. A separate bowl for the empty shells will also come in handy. For mussels in cream, reduce the wine to 1/4 cup and add 1/2 cup of heavy cream.